An ‘Improved Precedent’ or ‘Big Jumbo’ on an up express - but where ? 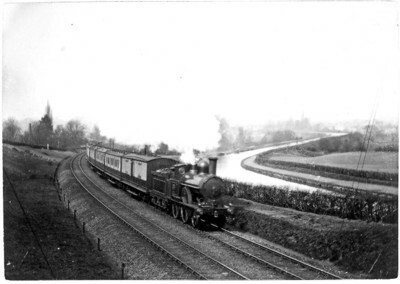 This is one of three pictures recorded by Loco & General as being taken by T.F.Budden near Weedon. It looks to be just north of the station with the diverging Daventry line hidden on the left. The mile post and signal both show on OS 1:2500 maps with the canal and towpath looking right. The loco is described as Improved Precedent and the train an up express but with no further description given. Many thanks for your solution to this one, John. I had been struggling with the OS 1-inch map which suggests that the Daventry branch would be visible. But the generalisation of that map, with railways shown wider than in reality, makes it look as if the lines were closely side-by-side, while your 25-inch gives an accurate plan. Presumably the branch is beyond the wide embankment on the left. The photo seems to date from between 1896 and 1902. “The photo seems to date from between 1896 and 1902.” As the coaching stock is six-wheeled, and the train presumably an express, I would guess an early year within this range. Whilst I have struggled to find an alternative for the location of this picture the alignment of the canal at the point that I assume this to be doesn't look right compared to the Ordnance Survey of the area. I don't know the area particularly well but the track in this area appears to have been realigned at some point with the Daventry line diverging in the station area rather than at a junction to the north of the position of the photographer but I am not sure when this change was made. However with regard to the canal the OS map and indeed google earth show the canal making an arc at the point without that straight section that I can see in the photo. I think the photograph was taken from about 300 yards north of the road overbridge at Weedon station, at National Grid ref SP626602. The branch to Daventry, as opened in 1888, left the main line just north of the station, at Weedon No 2 signal cabin, and rose from there on a steeper gradient than the main line, with which it ran parallel for 600 yards, before curving off to the west towards Daventry. There was quite a wide embankment between the two lines: this embankment can be seen on the left in the photo. My original idea that the branch junction would be visible on the photo was based on the small-scale OS map, but it was never like this, and the junction was always well behind the photographer. Is the mystery photo of Weedon perhaps taken from Bargee’s bridge the first over bridge north of Stowe Hill Tunnel at ~69M 1640Y, looking north towards Weedon Viaduct.Showing where the railway and canal diverge south of the church, there is a house in the vee now which makes things look a bit different. I don�t think either the railway or canal are on a tight enough curve for it to be just north of the old station site, and if it was I think you would see the branch to Marton Junction. The location appears to be fairly accurately identified, which was obviously the reason the photo is here. What I am concerned about is the date. While I hesitate to contradict Philip, I believe that the front portion of the train is principally made up of corridor vehicles, I am fairly confident the first vehicle is either a 45' D381 or a 50' D 378 Brake van, It appears to have a corridor connection. I can see the the bogie axleboxes at each end and the step boards between, I believe at least the next three vehicles are also bogie vehicles. That being the case surely it must be at the later end of the 1896-1902 date range, or even later than 1902?